Story: Many believe the prophecy from the Book of Revelation provides a map to a terrifying future - or it presents fragments of history that have come to life in our time. The signs, they claim, are all around us: terrorist attacks, extreme weather - the list goes on. The passage specifically points to the arrival of the Anti-Christ, who is branded with the numerical sequence "666": the mark of the Beast. The Anti-Christ will receive his power directly from Satan to establish a counterfeit kingdom on earth, signaling the beginning of Armageddon. Robert Thorn is unaware of such dark prophecies. Thorn, a senior American diplomat, has other things on his mind. His wife, Katherine, has endured a difficult delivery and she's as yet unaware their newborn child has died. Devastated by the loss, Thorn's concern turns to Katherine, who had suffered two previous miscarriages. The news will surely devastate her. The hospital priest, Father Spiletto, presents Thorn with another child born that night, whose mother died in childbirth. The priest compels Thorn to take the infant boy as his own; Katherine will never know the truth, and their son, which they name Damien, will be raised as their flesh and blood. Katherine embraces the child as her own, blossoming in motherhood; Thorn, it would seem, has made the right choice. Thorn's career ascends - he becomes the U.S. ambassador to Great Britain - and the family settles into an estate outside London. 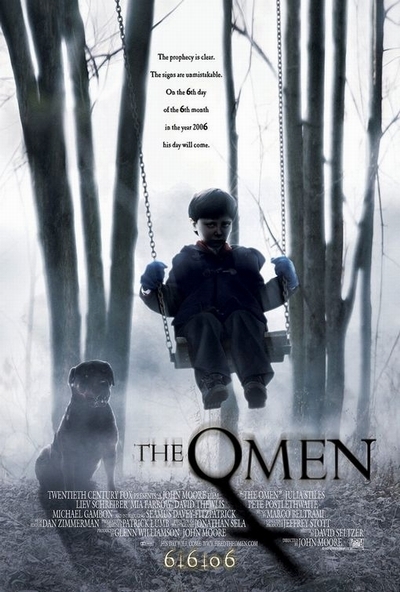 But certain events, all seeming to revolve around the now five-year-old Damien, are deeply disturbing: Damien's nanny hangs herself at the youngster's birthday party; a strange priest brings dire warnings to Thorn; a children's trip to the zoo results in a panicked frenzy; Damien becomes hysterical during a drive to church; and blurred movements in a series of photographs portend shocking deaths. The troubling incidents multiply, pointing to something wrong - terribly wrong - with Damien. Enter Mrs. Baylock, Damien's new nanny, who seems to have a preordained devotion to the child. Then tragedy strikes closer to home. But only later does Thorn comprehend the truth: Damien is no ordinary child; he is the long-prophesized Anti-Christ. Now, Thorn must make the ultimate sacrifice to prevent the unspeakable terror that awaits the world.